As read by Hugh Dennis on Radio 4! I caught the last episode over Christmas and it was funny, and available for 99p for my new kindle, so I bought The Etymologicon by Mark Forsyth. Who also blogs over at The Inky Fool. It is a series of brief chapters on the origin of words in English, where they come from and how they’re related. Or not, in the case of some sets of words that seem like they should be. It’s utterly delightful. I’m a word nerd. I love words, I love finding out where words come from and tracing the changes in meaning. I love how versatile and adaptable the English language is. So, there’s pretty much no way I wasn’t going to like this book, but I found I enjoyed it even more than I thought I would. It’s funny, engaging and covers words that don’t ordinarily appear in this sort of thing. I spent a lot of time smiling when I was reading it and laughed out loud several times. I highly recommend it! Finally, the last part of the Millenium trilogy! 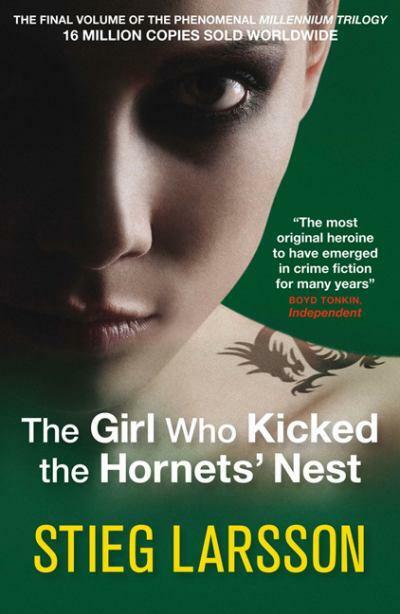 In Steig Larsson’s The Girl Who Kicked the Hornets’ Nest, Lisbeth Salander is arrested for the attempted murder of her father and her friends work hard to save her. Lisbeth has a bullet lodged in her brain and is taken to hospital where her life is saved but she finds herself under arrest. Blomkvist, Armansky and Bublanski’s team are working to find Niedermann and prove Salander innocent. Meanwhile the secret section within the Swedish security police realise that Zalachenko has created a huge problem and act to fix it. I’ve found the previous two books patchy – there’s a lot of good points and one or two bad points. Given that, this book is surprisingly good. There’s less of the repetitive summing up that slows the story down and a lot of action. The two sides are trying block each other and Larsson weaves these threads together in a way that keeps the tension going throughout. I particularly enjoyed the courtroom scenes. Larsson’s dialogue often sounds like the characters are reading reports to each other. I don’t know if that’s due to the translation or if the dialogue is just clunky. However, the dialogue in the courtroom scenes (which are mostly dialogue) really works. They are tense, emotional and gripping. The story is resolved in a satisfying way. The baddies get their come-uppance but the good guys have to work really hard for it. And there is one point towards the end where Larsson pulls off a convincing threat to a main character. I think I’ve enjoyed this book most of the three Millenium books and it lifts the trilogy as a whole. Breaking News: I have published stories! I’m so very excited. Fragments was published today and is available for download or as print-on-demand from DriveThruFiction.com. Fragments is a collection of eight short stories of the macabre and creepy kind, of which I have contributed four. It is available to buy for 99p which is incredibly good value. The format is pdf which can be read on kindles or smartphones or ipads or laptops so you can read it on whatever device you like best. Later in the week I’ll add a picture of the lovely cover art produced by my fellow contributor. I bought this book about ten years ago at a time when I was very depressed. 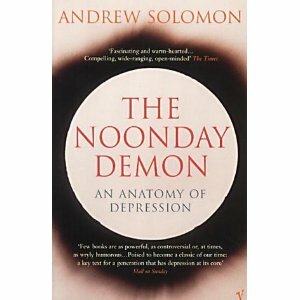 It seemed like The Noonday Demon by Andrew Solomon might be relevant but actually I found it too upsetting to read. The sub-title of the book is An Atlas of Depression. It starts with the author’s own experience and an overview of depression in the US today. It is quite heavily focussed on the US but does occasionally talk about other parts of the world. Then Solomon covers current treatments for depression, how it appears in different populations, its relationship to addiction, poverty and suicide, attitudes to depression in history and current politics, and how it might fit with evolution. Reading it at this stage in my life (I’m not currently depressed; episodes tend to be shorter and less severe; and I have an effective strategy for dealing with it), was easier in the sense that it wasn’t triggering, but it’s not an easy read. It’s full of fascinating facts, stories of the experiences of lots of people, and some interesting theories. I particularly liked the chapter on suicide and the revelation that feeling suicidal is not that well linked to being depressed. The chapter on depression in history was also interesting – depression is not a modern problem – and gave some insight into how the attitude that depression is weakness of character has developed. I also liked that while this is hung around the story of the author’s experience he presents a wide range of other stories. Solomon looks at how behaviours such as aggression and violence might have a root in depression. The section on poverty has some thought-provoking ideas about how treating depression could have an impact on solving social problems. What I didn’t like so much was what was missing. Somewhat inevitably, not every experience of depression is related here. While I found much that I could identify with, I didn’t find my experience. I’m one of those depressives that does a really good impression of not being depressed and while there were a couple of passing references to that experience, it isn’t given the same focus as other experiences such as being hopsitalised, or confined to bed for months at a time. Reading it now, that’s fine, but if I’d made it through the book the first time I’d have found that invalidating. Another little niggle is that the author dismisses being a woman living in a male-dominated society as a cause of depression. As Solomon seems to be able to get his head around the concepts of internalized racism and homophobia, it is a little galling that he can’t extend that to internalized sexism. However, these are small-ish points and I still found a great deal to enjoy in the book. If you live with depression, or are close to someone else who does, and are prepared for a moderately hard read, this book will provide a lot of insight. It’s not the whole story but it’s a good place to start.